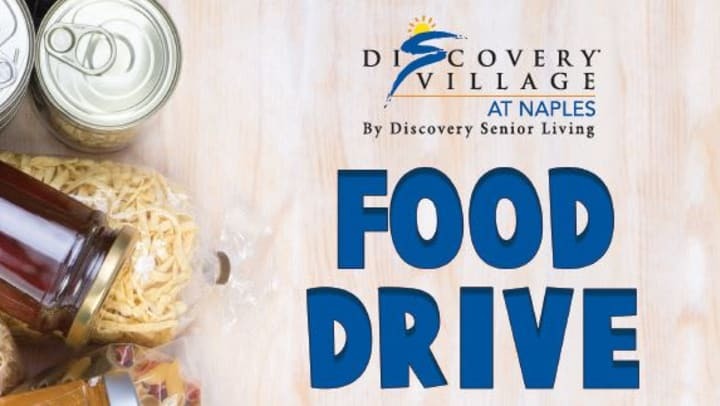 Naples, FL, March 2019 – Discovery Village At Naples, Assisted Living and Memory Care senior living community, will be collecting canned and dry goods throughout next month with all items to benefit Naples Senior Center Food Pantry. Naples Senior Center Food Pantry is a resource for seniors and their families in the Greater Naples area to address food insecurity and is available to all community members. Collection boxes will be located at the Discovery Senior Living corporate office, Dr. Demartino’s office, Dr. Wesley Drew Chapman’s office, Dr. Carlos Portu’s Family Practice, ManorCare Nursing & Rehabilitation Center at Naples and ManorCare Health Services at Lely Palms Rehab Skilled Nursing. A unique aspect of the Naples Senior Center Food Pantry is that it is designed for individuals to “shop” for food items they want rather than receiving a pre-packed bag or lunch. The Naples Senior Center understands that it is difficult and uncomfortable for many people to ask for assistance with food, which is why their appointment-style shopping is meant to preserve the client’s confidentiality. Discovery Village At Naples is one of the 53 communities across the United States owned, managed and operated by award-winning Discovery Senior Living, and industry leader in first-class senior living communities. The community offers state-of-the-art Supervised Independent Living, Assisted Living, and Memory Care. All amenities offered are designed to provide a carefree, luxury lifestyle while helping seniors maintain an active, independent and social life. Visit discoveryvillages.com to learn more. Discovery Senior Living is a family of companies which includes: Discovery Management Group, Discovery Development Group, Discovery Design Concepts, Discovery Realty Group, Discovery Marketing Group, and Discovery At Home, a Medicare-certified home healthcare company. With almost three decades of experience, the award-winning management group has been developing, building, marketing, and operating upscale, luxury senior-living communities across the United States. With a flourishing portfolio of more than 9,500 existing home or homes under development, Discovery Senior Living has become a recognized industry leader in creating world-class, resort-style communities. The Naples Senior Center at JFCS supports and enriches the lives of seniors and families in the Greater Naples community by providing tools to address life’s challenges. The senior center is a dynamic gathering place with a safe, nurturing environment for seniors to socialize, learn and stay active. Membership has grown from 80 seniors in 2014 to over 1,400 seniors today due to an increased demand for services and a growing senior population.